Some days just call for COOKIES! Today is that kind of day. I’m not going to beat around the bush here, I’ve had a couple stressful days in a row, with some blog hiccups (sorry if you are viewing this post through Safari and have been seeing weird characters – hoping this is going to be fixed soon…like today! ), work related issues, and a few other little things. But I am totally not here to complain. It’s my favorite time of year and happy thoughts will be had all around! Also, did you notice that today I spelled Chai correctly!! Yes, after everyone pointed out on my Apple Cinnamon Rolls with Chai Frosting that I had spelled Chai, Chia, I was so beyond embarrassed that this time I made sure every last spelling of the word was correct. Promise, I know the difference, but when typing quickly, I easily get the two mixed up. 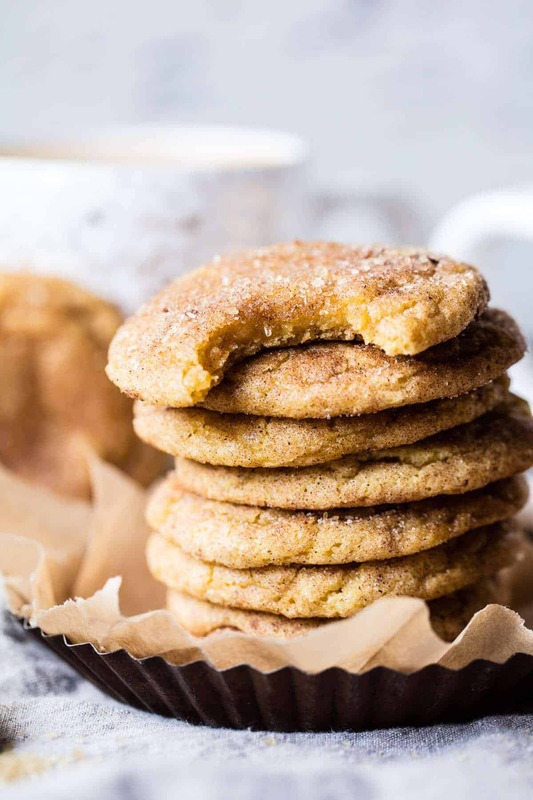 Pumpkin Chai Snickerdoodles from Half Baked Harvest on Vimeo. Anyway, back to the actual cookies at hand! Back when I was a kid my family would go to our Aunt Debbie’s for Thanksgiving dinner in Pennsylvania every year. My aunt made a HUGE spread of all kinds of amazing sides, rolls, and probably three turkeys in order to feed all the family members present. I think she must have worked for weeks and weeks leading up to the big day. My mom and I had a favorite recipe that my aunt made for us every year. Looking back now I realize what a pain it must have been, not wanting to disappoint us, and therefore making them year after year. Every year when we arrived, there they were, Aunt Debbie’s famous Turkey Cookies. Pretty sure I’ve talked about them before, but guys they are good! Sadly, I do not have the recipe to share, but this year I decided to make my own little Thanksgiving cookie, and well, these are almost just as good! These are actually very different from Aunt Debbie’s Turkey Cookies, which were more of a frosted butter cookie…and pretty dang cute with all of the varied colors in the tail. But these snickerdoodles are delicious in their own special way! 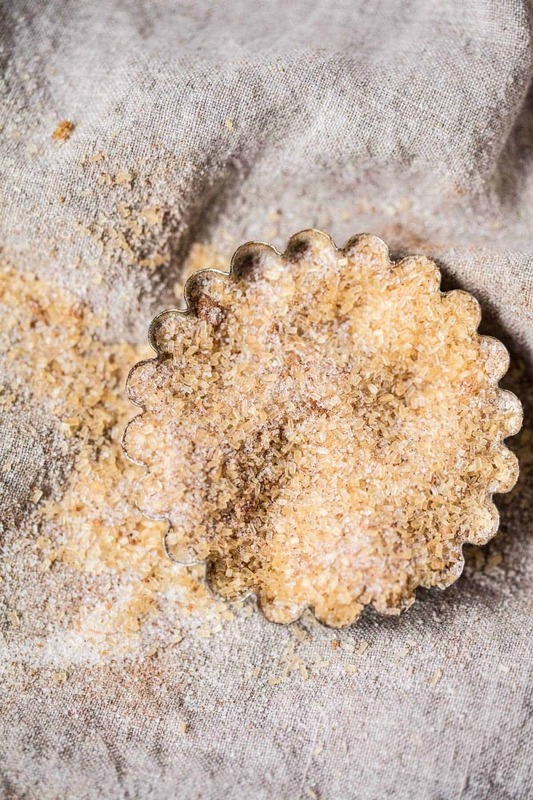 I think most of us are pretty familiar with a snickerdoodle. In my book, they are an essential holiday cookie and should be in every Christmas cookie gift box (just sayin’). As I was hiking a couple of months ago, brainstorming about pumpkin recipes and all of the Christmas cookies I would make this season, this cookie came to mind. And when it did, I knew it was one of those recipes I just had to make. 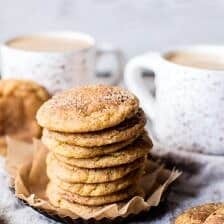 These cookies have a pretty simple twist on the traditional snickerdoodle, but trust me – it makes all the difference. 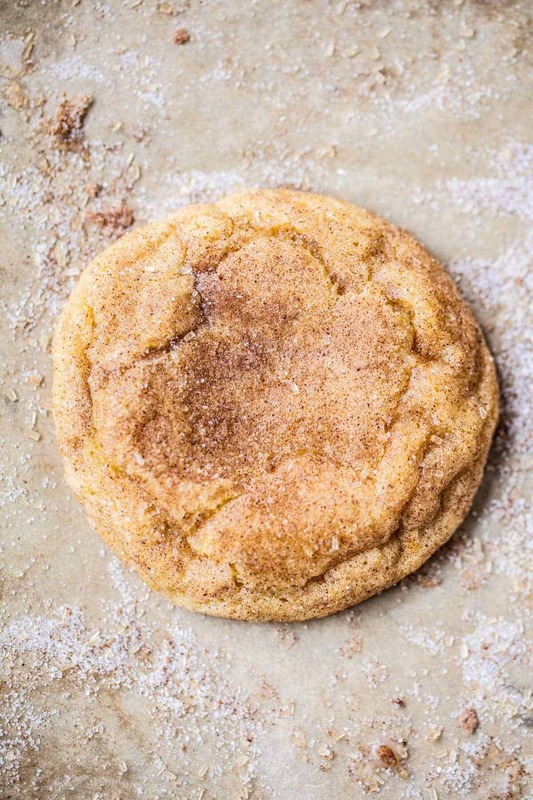 Pumpkin + Snickerdoodle + Chai Spice Sugar. Yesss! Literally I am jumping up and down as I horribly attempt to type this post. I really do love these cookies, they represent everything I love…sweet, chewy, soft, cinnamony, totally not cakey, and all things cozy. <–if you didn’t already know, cozy is probably my favorite word ever. Can I just say that I do think chai sugar is totally the new cinnamon sugar. 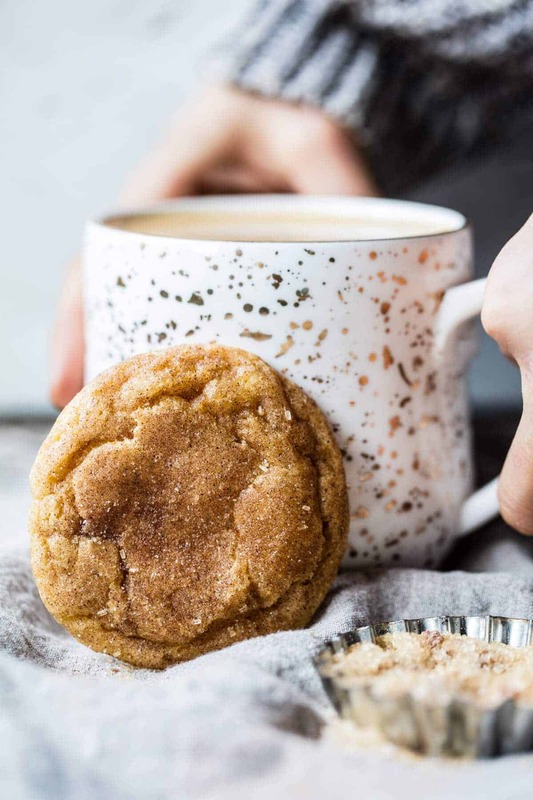 It’s just cinnamon sugar kicked up a notch with ginger, all-spice, cardamom, and cloves added, but it is truly my current obsession. I’ve been adding it to everything from warm tea, to toast…to cookies, SO GOOD. Oh, and I forgot to add that these cookies can totally satisfy your cookie craving in under 30 minutes. Yep, in less than a half hour you can be chewing away through soft doughy bliss. Soo, can we please all agree that these are the perfect holiday cookie for both Thanksgiving and Christmas? I always fear that pumpkin recipes aren’t relevant in December, but is that really true? I think this could just be my crazy brain? What’s your thoughts on this? Pumpkin in December? yes? no? Tell me I am dying to know! As of today I am going to be changing my tune. These cookies will for sure be getting sent out in my Christmas cookie gift boxes. Plus, they’re totally happening again on Christmas Eve because they are just that good. AND I will also be making a double batch for Thanksgiving, because well, they just might be better than pumpkin pie…don’t hate me, but I think it’s true! In a medium bowl, combine the flour, baking soda, cream of tarter, salt and nutmeg. Using an electric mixer, in a large bowl beat together the butter and sugar until light and fluffy, about 2 minutes. Add the pumpkin, egg, and vanilla and beat until combined. Gradually add the flour mixture, mixing until just fully combined. Make the chai spice sugar. In a small bowl, combine the sugar, cinnamon, ginger, all-spice, cardamom, and cloves. 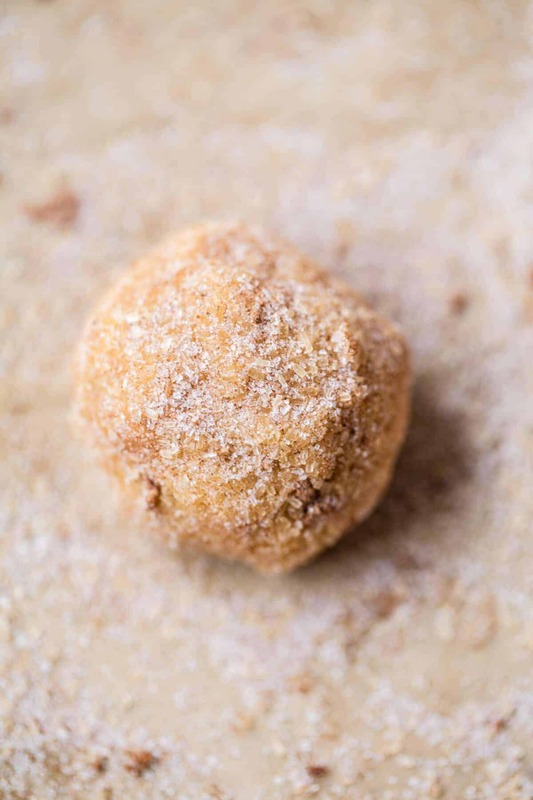 Roll the dough into 1 tablespoon size balls and then generously roll through the chai sugar. Place on the prepared baking sheet, spacing the cookies 2 inches apart. Transfer to the oven and bake for 8-9 minutes or until the cookies are just starting to set around the edges. I find it best to remove the cookies when they still seem doughy in the center. They will cook more on the pan once they are out of the oven. If desired, you can brush the cookies with a little melted butter and sprinkle with the remaining chai sugar. Cool and then store in an airtight container for up to 4 days. Cookies adapted from [Martha Stewart | http://www.marthastewart.com/1132583/pumpkin-snickerdoodles]. Tuesday cookies saving the day! Ohhh, that chai sugar does sound good! I’ve made chai syrup this weekend and I’m obsessed with it – but that sugar sounds so much easier 😉 Anyway, I’m sorry you’ve been feeling stressed lately, just know that I’m reading this on Firefox and I encountered 0 problems 😉 Except for the fact that I can only LOOK at your cookies and not taste them, which is something that needs to be fixed ASAP. I can only imagine how cheered up you must feel after having a batch of those! YESS Chai syrup is delicious!! SO happy you had no problems!! Haha Thank you so much!! They always seem to do the trick!! This is ture, some days DO call for cookies, trust me!! These look and sound YUM! Glad we both agree!! Haha! Thanks Ruth!! I’m all about Tuesday cookies!! Tuesday… Wednesday!! Any day Haha! Yum! I really need to make these. They have to be so good. I wondered if you knew you were having some glitch issues. I read in Safari and it started last week. Hasn’t been any in this post though. hey Charlotte! Thank you so much! Hoping to get the issues fixed soon. Thanks again and have a great day! These sound incredible! Chai spice makes everything better, and I love the idea of combining it with pumpkin. I think that argument is very valid!! Yes, its so so good!! Thanks Allison so happy you like them!! Yes! So true, they did just that! These look like beautiful cookies! Wow! I swear, cookies are the best thing to fix a bad day. 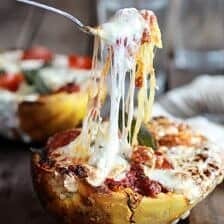 These look amazing Tieghan! Can I ask where those mugs are from? They’re beautiful! These sound so good! If I don’t have cardamom, could I sub half nutmeg/half cinnamon? Hey Sarah! Yes! Half nutmeg and half cinnamon will be so good! Let me know if you have questions. Hope you love these. Thank you! ? this looks so sugary!!! love it. Me too (:!! Thanks Christine!! I need these cookies in my life!!! They look so perfect! Yes you doo! Thanks so much Lili!! This sounds soo good. Definitely cozy, especially if served with hot chocolate. I love your mug! Where is it from? I just started making Christmas cookies to distribute throughout the holidays last year and to be honest, I don’t really trust my baking skills like I do for everyday cooking (plus moving to Colorado and dealing with high elevation freaks me out, so I put my trust in you when it comes to baking!). These seem like they will make a super yummy and EASY cookie to add into the holiday baking rotation! Thank you!! Thats so awesome that you trust me with the baking (: Makes me smile! Hope loved them!! Thank you!! Love the photos! What lens/lenses did you use? Thanks Aaron!! I used a 50mm 1.2 and 35 mm for this post. Let me know if you have other questions. Thank you! Oh my Goodness, Tieghan! You caught my attention with these! 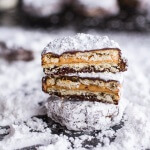 I love the idea on all accounts, then looking at your recipe I am sure these will be amazing! Butterscotch Gingerbread cookies have been my fall favorite cookie for years, but this might give them some strong competition. Pinning to my menu for this week. Thank you for sharing! Weeeee, what a quick and easy soiloutn. Thank you!! They’re my favorites too!! Its so frustrating!! Luckily everything is under control!! More importantly the cookies were exactly what I needed!! They look SO good! I’ve never had snickerdoodles, it’s sad! And can I say once again that I’m obsessed with your photography?! If you don’t mind me asking, do you use natural or artificial lighting? 🙂 Have a great day! Thank you so much!! OMG you need to try them!! I use natural lighting!! Hope that helps!! These look great! And I’m going to make a triple batch of the sugar just to have on hand. I say we rock pumpkin all the way through New Years. Why not? It goes so well with all the cold weather spices I see no reason to abandon it when Thanksgiving is over. Thats true, and its just so delicious!! Oops! I meant to say I can’t wait to make these cookies ! I can ALWAYS contrive a reason to bake cookies. Bad news? Comfort cookies. Good news? Celebration cookies! And I’m sorry it’s been stressful for you recently, I hope it gets better. You are such a light to so many people, and so enormously talented. If pumpkin isn’t still relevant until midnight on December 31st, the food world is too trend-oriented and moves too fast. YES! So agree theres always a reason to bake!! Wow that is so so nice!! Thank you so much!! YES! Hope that you love them!! Thank you Elizabeth!! Oh yes!!!! 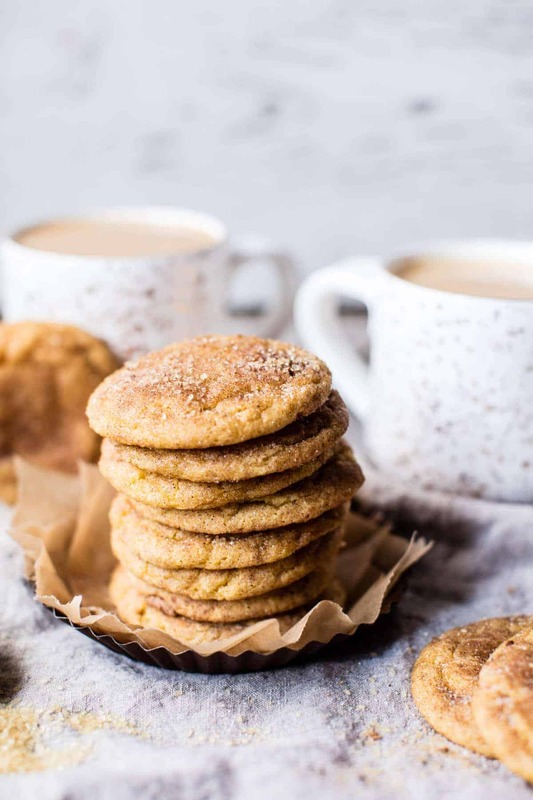 Give me stacks of snickerdoodles any day and all is right in the world! Its all we need! Thanks Tori! These look sooooo delish. I also live in Colorado and have family in Pennsylvania! Love your blog btw. 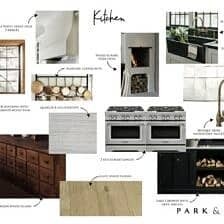 I’ve worked as a baker and your recipes make me want to create again! Awh I am really happy my recipes make you want to bake again! Really awesome to hear. Thanks so much Jaclyn! I just made these last night and they were so good!! I think this will be how I make snickerdoodles more from now on 🙂 I had to make a few modifications as the friend I made them for cannot have dairy, so I used coconut oil instead of butter. I unfortunately did not have all the spices needed for the spiced sugar, so I just used sugar, cinnamon, and some ginger for that. They still came out really well and had the same texture as a snickerdoodle – thank you again for this recipe! So happy they turned out great for you Ankita!! Thank you so much! I am totally baking these tomorrow! Can I use anything instead of cream of tartar or do I need to make a trip to the grocery store? Awesome! I hope you love them Carla! Thanks! Really glad you are loving these Kate! Thank you so much! I just made these and I have to say I’m a little saddened. They didn’t spend at all and baked up like little cakes. The flavor is great but I was expecting a thin, chewy snickerdoodle. Not sure why they didn’t turn out like yours. Any suggestions? Hey Rachel! I am really sorry these did not turn out the way you wanted. How long did you bake them? Did you take them out while the center was still a little doughy? this will give you the best results and I think it is key to this recipe. Let me know if you have questions. Thank you! 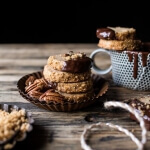 Snickerdoodles are the best, and these beauties look incredible! Thank you so much Laura! Happy you are loving these! I have baked many many batches of cookies in my day, and these are THE. BEST. 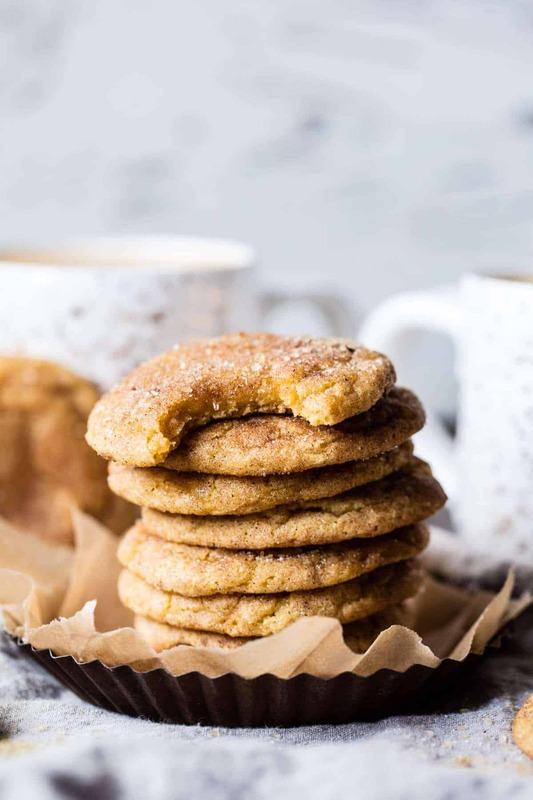 Pumpkin chai snickerdoodles, you have ruined me for all other baked goods!! WOW! Thank you so much Anna! I am so glad these are your all time favorite! I just made these & had Rachel’s results ? I did drizzle melted butter & the Chai sugar after they baked, & they are quite tasty ? I hope they turn out great, and yes let me know! Thanks Kristy! I ended up flattening them as soon as I took them out of the oven (& only baked them 7 – 8 minutes). Buttered & sugared them too ? The fam prefers the puffy batch, so I sent the 2 dozen normal ones to our church Thanksgiving lunch today ~ they were a hit! Not many of the “Snickerpoofdoodles” are left here either ? P.s. Egg nog, or egg nog ice cream is a lovely companion to these, just sayin’ ? Thank you so much Kristy!! Made these cookies this evening and they are fantastic! It is possible that I have already eaten 3 cookies! And I still want more. Great recipe. Can’t wait to make them for Thanksgiving. Mine puffed up to. So for the second batch I flattened the cookies before I put them in the oven and they had more of a “cookie” shape. They are so delicious I really don’t mind them puffed up. Wow so happy you are loving these Kaylee!! Thanks so much! 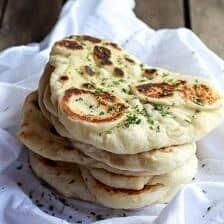 Dying to make this for thanksgiving, searched three grocery stores this weekend for cardamom with no luck. So my question is, is this an essential ingredient? Can I just use the other spices and get the same effect? Hi! I am SO sorry. I somehow missed your questions. I know it is late, but you can just omit the cardamon. Again, so sorry! Hope you love the cookies! I am thrilled these went so awesome for you, Christine!! Thank you so much! I am thrilled these cookies were so awesome for you Christine!! Thank you so much! 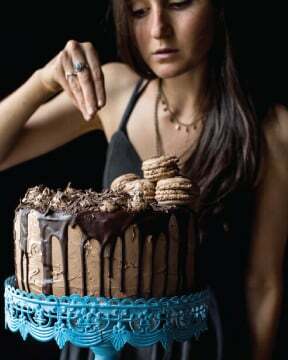 I’m looking forward to making these this weekend! If I wanted to double the batch & freeze half, should I roll them in the chai sugar before freezing or later when I bake them? Thanks so much! Hey Meg! I would roll in the sugar then freeze, but I am sure either way will work great. Let me know if you have questions. Thank you! Wow! So happy you like them Lena!! Hope you love everything and thank you!! Don’t worry love! We all have our poopy days, whether too many roadbumps were encountered or we just don’t feel our very best. So happy that these cookies came to the rescue! They look absolutely DIVINE! I am so glad you enjoyed them Saragh! Thank you! 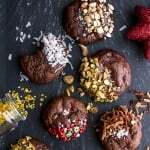 I made these cookies yesterday and they are amazing!! Mine actually came out a bit puffier than yours in the picture, which was a great surprise because I adore soft cookies! Definitely making these again for the holidays. This recipe did not work for me sadly! 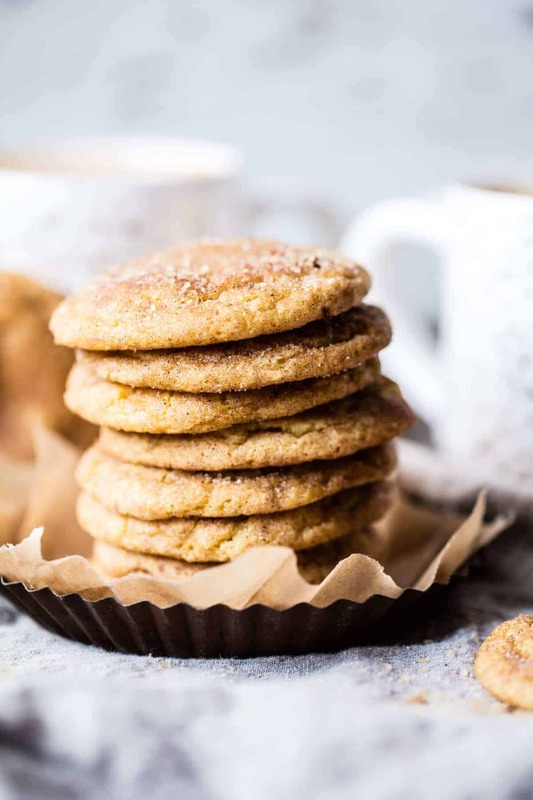 I frequently bake snickerdoodles using the Martha Stewart recipe (as adapted by Deb Perelman on Smitten Kitchen), and I was excited to try this pumpkin variation. Unfortunately, my cookies did not spread as they are supposed to. In comparing the recipes, this one has much less butter and leavener, so maybe that is why? Mine ended up very cakey and tall. They were still good, but not the classic snickerdoodle texture and chewiness. I made these last night, and they are a hit in the office this morning. I didn’t have the ingredients for the chai spice mixture (so sad), so I used the mix from your ‘Easy Twisted Pumpkin Spice Danish’ instead and they were delicious. 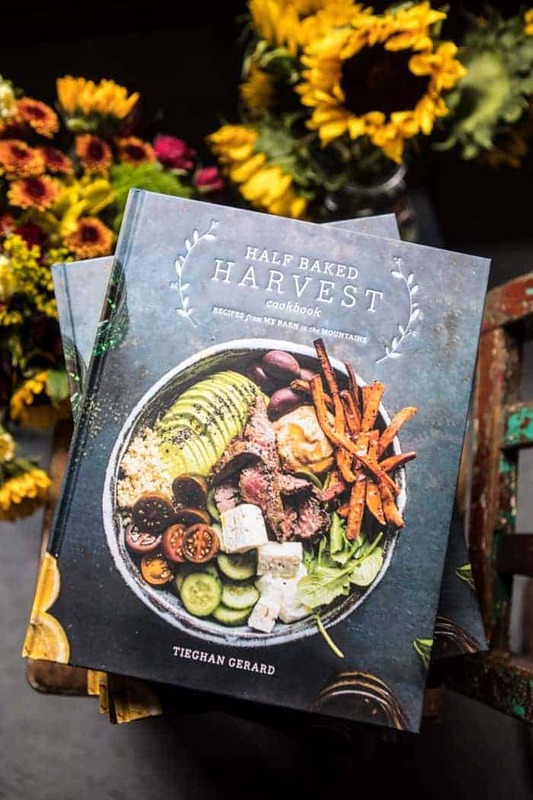 Thank you for always having the perfect seasonal recipes! That is so amazing! Thank you Kathleen! Just tried these last night. I’m not sure what happened, but mine came out way too moist to be able to roll into balls. I ended up dropping them by spoonfuls and they baked into these really light, puffy cookies that tasted good, but were nothing like usual flat and slightly crunchy nature of a Snickerdoodle. I wonder what I should have done differently. Thanks for sharing, though! Hello! 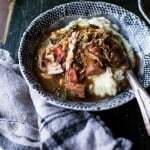 I know this is an older recipe, but just in case anyone else is trying it in 2018 like me, I wanted to add a review! These turned out so delicious! However, like a few others before me have said, they turned out very doughy! I wasn’t able to roll the dough into balls, and then roll them in the sugar. The dough was very moist! I cooked them, and they didn’t really flatten. They are more like a small scone, or donut hole like some others have said. They taste GREAT!! I’m thinking about adding a drizzle of icing on top or something! They are very good, but definitely not snickerdoodles! Hi Michelle! I am so sorry about that. I am glad these still turned out amazing though! Hi, I made these cookies yesterday and I think that they were a little cake-y. I like more chewy snickerdoodles. What would I need to modify to make them more chewy? The dough was very sticky too. I put it in the frig to firm it up a little and it helped some but still too sticky. The flavor was good but I want to tweak the texture a little more. My dad loves snickerdoodles and I’m going to give him some. Also I doubled the recipe because your quantity said it made 12 cookies???? I got at least 40 big cookies doubled. Just sayin’ Flavor of the sugar is great. I made these and also had the same result as many others, where they didn’t flatten out while baking and had a fluffy cakey texture. The first batch were so domed and puffy, I flattened them after baking with the bottom of a glass cup. These were ok but compressing them this way made them denser and they seemed a tiny bit doughy in the center. The next batch I flattened them with the glass after placing on the baking sheet, and then baked. These were much better. They still had a cakey texture but were much more like cookies. I took them to work and my coworker’s LOVED them. One (gasp) said she’s never had anything with pumpkins before, and she was crazy about these! She still talks about them 2 weeks later and wants me to bring them again. So even though they weren’t what I expected, they were still a success! Wow that is so amazing! I am so glad you and your coworkers loved these Kimiko! Thank you so much! And thank you for adding your tips for others to try! I followed the recipe to a T: measured the flour “correctly” (the scoop-with-a-spoon method), creamed the butter for a good 2 minutes, made sure the egg was at room temp so it would evenly combine with the other ingredients, chilled the dough for 45 minutes. My dough came out super sticky too, and my baked cookies (7.5 minutes) are puffy instead of thin and chewy. 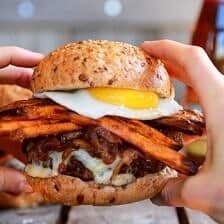 I really wanted this recipe to work out! The flavors are great and these cookies will definitely not be uneaten, but the texture just isn’t what I wanted it to be or anything like the photos. Ugh! I’m so upset, I tried making these cookies today because they look SO GOOD!! But the first batch didn’t flatten at all in the oven and came out cake-like as if I’d made sugar-covered bread rolls! HELP! What did I do wrong? I did double the recipe, so maybe the ratios weren’t perfect. Any suggestions on how to fix this? I ended up having to flatten the cookies with a cup before sticking them in the oven.